ONLY 55 lbs., without batteries. Easily breaks down for transport with the heaviest piece weighing only 25 lbs.! Introducing the Ultra Lite Scootie Jr.!! The Scootie Jr. is only 80 lbs. with batteries, 55 lbs. without batteries. The Scootie Jr. breaks down easily and the heaviest piece is only 25 lbs.!!! Unlike other travel scooters on the market today, the Scootie Jr. offers a fully padded, pillow top seat with flip-up, width adjustable armrests as standard features. The front basket is also standard. The quick release battery pack and fold-down tiller allows the user to disassemble the scooter and store it in the trunk or back seat of the smallest car in less than a minuet with no tools!!! Angle adjustable footrests are completely new on the market, and offer the rider the ultimate in adjustability. 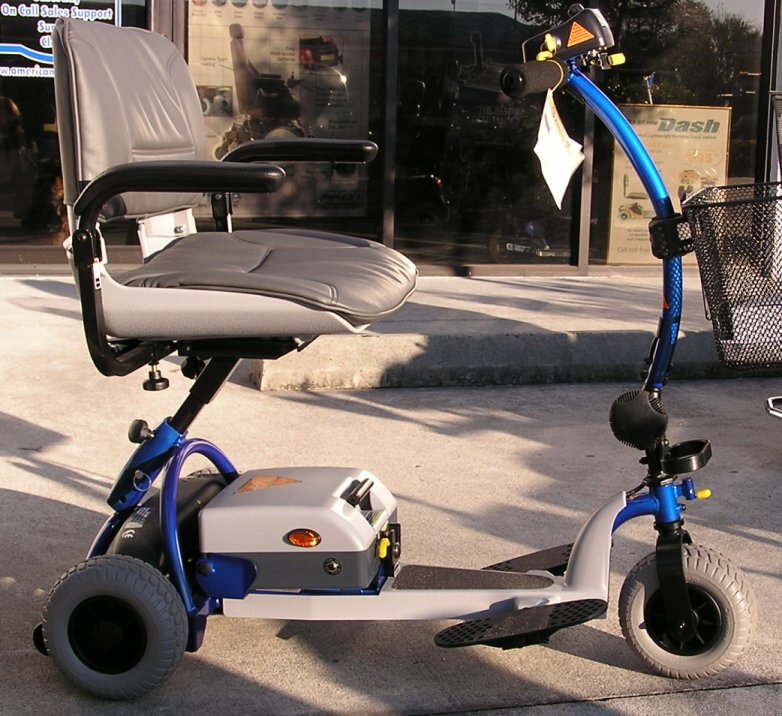 The Scootie is considered a "Travel Scooter" and is not covered by Medicare DME Insurance. Light weight, compact design offers great maneuverability. Heaviest piece only 25 lbs.!!!! Easily dismantles without tools in less than 1 minuet. Fits easily into the trunk or back seat of compact cars. Flip down seat back with pillow top padding. Flip-up adjustable width armrests. Weight w/o batteries 55 lbs. Flat free tires, fold down tiller. Easy disassembly for transport and storage! Weight of heaviest piece only 25 lbs. Total weight with batteries only 80 lbs.!! Weight Capacity 250 lbs.